Born: 1909 and died 9 July 1998 aged 88. Son of: Hugh Lionel Heath (1871-1938) Principle of Mayo School, Lahore, who married, in 1903, Maggie Forsyth (1879-1939). 1. Margaret Jean Harris (nee Heath, then Lightbody, 1913-2000), known as Jean. She married 1st in 1940 Robert Lightbody and 2nd, in 1962, Norman Harris (1910-1994). Jean died 17 March 2001. 1st, in 1938, Kathleen Mary Gibson (1915-1988), known as Mary. 2nd, 7 December 1989, Lisa Cooke (Ethel Dutton, 1905-1996). 1. Julia Farwell (born 1940) who married Wing Commander Jeremy Farwell (1933-2002). 2. James Heath (born 1944) who married Elizabeth Viner (born 1947). The following is from his obituary printed in The Times newspaper, 29 July 1998. Air Marshal Sir Maurice Heath, KBE, CB, CVO, former Chief of Staff Allied Air Forces, Central Europe, died on July 9 aged 88. He was born on August 12, 1909. Maurice Heath was in the news in the late l950s when the Defence Secretary, Duncan Sandys, appointed him the first joint-service chief of British Forces Arabian Peninsula, a new command directly responsible to Whitehall. The command was based in Aden, covering East Africa and the Gulf, and Heath's capacity for crisis management was soon tested by the Iraqi revolution and the murder of the country's young King Faisal 40 years ago. As troops were put on alert, he flew back for consultations with the Macmillan Government which was fearful over the ramifications for the Gulf region. But no one could prevent the new Iraqi regime's withdrawal from the Baghdad Pact - the treaty organisation formed three years before with its headquarters in the Iraqi capital to protect the crucial Middle Eastern oilfields from Soviet influence. The pact had to be recast as the Central Treaty organisation, based in Ankara, which was itself disbanded following the Iranian revolution two decades later. Heath meanwhile returned o Britain in 1959 to take over is commandant of the RAF Staff College for two years, before moving to his final appointment as Chief of Staff Allied Air Forces Central Europe, a NATO post then based at Fontainebleau during a time of East-West tension following the Cuban missile crisis. He retired in 1965, a year before President de Gaulle withdrew France from NATO's military command and forced the alliance to seek new headquarters in Belgium. Yet Maurice Lionel Heath's choice of a career had come as a surprise to his own family. He was born in London but brought up in India where his father Lionel Heath, a distinguished painter of miniatures, had become Principal of the Mayo School of Art in Lahore. He came from a long line of artists stretching back to James Heath in the 18th century, a contemporary of Hogarth and historical engraver to King George II. It was perhaps in rebellion against this family tradition that Maurice, despite a natural aptitude for drawing (which he always denied), decided to do something very different. He returned to this country at the age of 12 to board at Sutton Valence School in Kent, and passed from there to the RAF College, Cranwell, where he was a contemporary of Douglas Bader. Commissioned in 1929, he returned to serve in India for four years before being turned into an armaments specialist, a role which was to dominate the first half of his career. For part of the war be was chief instructor at No I Air Armaments School, training air gunners and bomb aimers, before being made station commander of the Bomber Command station at RAF Metheringham. 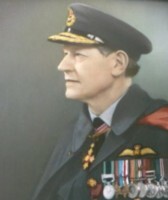 He was mentioned in dispatches during his time at Metheringham and developed a great respect for his Commander-in-Chief, the legendary Sir Arthur "Bomber" Harris. He was deputy director-general of armaments at the Air Ministry after the war, then given command of the Central Gunnery School in the late 1940s. After two years in New Zealand as air attaché, he took charge of Bomber Command's Bombing School, the last specialist armaments appointment which he was to hold before a sequence of senior staff appointments. He left for Aden in 1957. After retiring in 1965, Maurice Heath became a working director of a London firm of estate agents and was also involved with a finance company and was a highly successful appeal director for King's College Hospital and Medical School. In 1977 he was made a Deputy Lieutenant for West Sussex. More notably, however, he was appointed in 1966 a Gentleman Usher to the Queen and for the next 13 years he was a familiar figure at Palace functions such as royal garden parties, shepherding those waiting to be presented. He was made an Extra Gentleman Usher on reaching the retiring age of 70. Between 1965 and 1974 he was also chief Honorary steward at Westminster Abbey, and he was closely involved in the 1973 weddin1 Princess Anne to Capt Mark Phillips. A less official role, but on which he took great pride, that of one-time mentor to the artist David Shepherd. While commanding in Aden he commissioned Shepherd - then best known as an aviation painter - to produce some work for the new command. Among the pictures Shepherd produced was one for the RAF in Kenya showing a rhinoceros chasing an aircraft down a runway. He charged £15 for it. But the success of this, his first animal picture, helped Shepherd himself to take of a new direction, to make fame and fortune as the country's best-known painter of wildlife. When David Shepherd featured in a This is Your Life television programme several years ago, Maurice Heath appeared on it and the artist, by that time a close friend, acknowledged his debt to the Air Marshal. A tall, well-built man with strong views, Maurice Heath kept himself fit by gardening and mentally active by writing to The Times, when he felt things needed saying. He married his first wife Mary, in 1938 after meeting her at a dance at RAF Wittering, near her parents' Lincolnshire farm. After her death years later, he married his second wife, Lisa, a colonel's widow. She died 18 months ago and he is survived by a son and daughter from his first marriage. An obituary also appeared in the Daily Telegraph (29th August 1998).